Class size matters! Smaller numbers in younger classes, no more waivers, proper staffing and funding for specialists outside of the unit-count system. School Funding! Our current school funding structures are archaic and fail to properly address the modern costs of education. Accountability is still not right! We have to continue to push back against an accountability system that has more negatives then positives. Component 5 continues to be flawed and other parts of our current evaluation process fall short of providing real professional growth. Our buildings need to be safe learning environments! Air and water quality must be tested often, and specific concerns must be addressed immediately. Our staff and students deserve funding for School Resource Officers in every building and a Community Resource Counselor: A person dedicated to connecting students and their families with necessary community resources not offered by the school! Step increases stay! Each year DSEA works hard to keep step increases in the budget. We need to continue to work to ensure that these increases continue while we look for new ways to further teacher compensation. Education Support Professionals need to be better compensated! Paraprofessionals, food service workers, secretaries, bus drivers, and custodians deserve respect and a wage that honors the work they do for our communities. Health care is a concern! We need to monitor and be involved in any major changes that involve our heath care insurance. It is a benefit that needs to be guarded. There is power in numbers! We need to build strong coalitions and establish meaningful relationships with other organized labor unions in our state and beyond. Working together with these groups on programs and concerns strengthens our association. Service matters! There are a number of ways our members can be active in our communities. We want to build and nurture a culture of service. Local business partners also offer valuable connections! Local businesses are the cornerstones of our communities. These businesses value the work our members do with our students everyday and will prove to be a powerful partner. I want to continue to advance the DSEA vision of standing strong for student success and continue the momentum generated from recent DSEA work with reading and literacy, ESSA and Time to Teach, Time to learn initiatives. Hello, my name is Donato Carmine Rufo, and it is an honor to run for DSEA President. I was born and raised in Wilmington, Delaware. My mother and father came to America in the 1950’s from Italy. My parents worked hard, and instilled in me a love for this country, and a strong sense of pride and value in one’s work. I considered us a “Blue Collar” family with strong roots in organized labor. My mother worked at the family pizza shop on Union Street, and my father retired with the United Auto Workers having worked at General Motors for 28 years. His commitment to his Union, and his Union’s commitment to him was palpable. I still drive by the shuttered GM plant that put so much food on so many tables for so long and wonder what happened. I attended the University of Delaware and received my BA in Social Studies Education in 1995. I began my teaching career at Wilmington High School. I have also held teaching positions at New Beginnings and The Community School, both Alternative School programs. In 2002 I accepted a position at Delcastle Technical High School, and have been there since. These positions have afforded me opportunities to work with wonderful individuals both in our District and state-wide. This year marked my 20h year in Delaware Public Schools. Over the years I have attained Special Education certification, and I earned my master’s degree in School Administration in 2009 from UD. I have coached many sports, and have also been an advisor for several clubs and organizations over the years. I was awarded regional awards as Student Council advisor and I have been nominated for Delcastle Teacher of the Year numerous times and received the James H. Groves Adult Education Teacher of the Year award in 2007. Athletics and clubs/organizations have always been important parts of a student’s academic life, and I think all extra curricular activities should be nurtured in our schools. These include fine and preforming arts, as well as other creative outlets for our students. It has been my privilege to serve as the NCCVTEA Treasurer and currently President. It has been a true reward to be able to serve my friends and associates in this capacity. I have attended all meetings and conferences at both the local and state level and have always tried to foster a spirit of open communication and good will. I have been a good advocate and strong ally for the Teachers and Paraprofessionals of the NCCVT School District. Over the years my experiences with the Association have provided me the opportunity to work closely with staff and administration to resolve issues, cooperate on solutions, and safeguard member rights. I have been involved with contract negotiations, and have been asked to serve on several DSEA Task Force and focus groups. I began paying attention to, and getting more involved in, public education policy issues in 2008 with Governor Jack Markell’s announcement of significant pay cuts to all State Employees. I began my first Social Media campaign against the Governor’s plan. Within days my Facebook page had close to 3,000 members, and was a key factor in the formation of a coalition of state employee unions that countered Markell’s efforts. Our group was successful in changing the budget plans that year, and since then I have continued to get involved in school employees’ rights and student success. I live in Brandywine Hundred with my wife and two children. I am a native Delawarean and am proud to have grown up and attended Wilmington schools. I look forward to working with everyone and building new momentum, energy and focus for our association. I believe that our schools can be the best in the nation, which will be a direct reflection of the great teachers and Education Support Professionals we have in Delaware. It would be a true honor to serve as DSEA president and ensure a bright future for all of us. 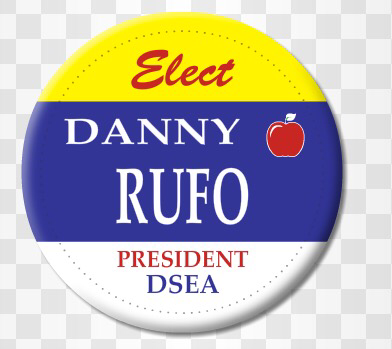 Danny Rufo for DSEA President!! 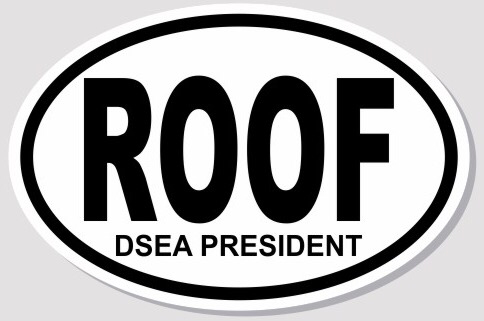 Please consider voting for Danny Rufo, DSEA President. It would be an honor to serve the Education Professionals of Delaware! I have abilities and experiences that will serve our membership, and my knowledge drive and personality will benefit our Association, our Students, our families and our communities. I am currently in my 20th year of teaching, with the last 15 at Delcastle High School. I have been involved in a variety of teaching, coaching and leadership roles. I have also been involved with the Groves Adult Education Program, where in 2007 I was recognized as Teacher of the Year. I have had 5 years of experience as the NCCVTEA Treasurer and 3 years as President. These positions provided me the opportunity to work closely with staff and administration to resolve issues, cooperate on solutions, and safeguard member rights. This work has inspired me to pursue a position where I can continue to be a positive influence in our schools, actively guiding staff and ultimately improving student achievement. As DSEA President I can continue this work. I have taken advantage of any and all opportunities that enable me to grow professionally. I have gained valuable experience from National Leaders and regional experts, having attended NEA workshops and conferences all over America, and have recently worked with teachers and labor officials from the Mid Atlantic area in Kentucky. That experience directly manifested itself in a recent campaign I organized concerning teacher retirement issues in Delaware. I have been an active participant/attendee at several committee meetings and public forums dealing with educator salary reform, educator evaluation regulations, and Wilmington re-districting. Please visit www.rufoblog.wordpress.com and www.facebook.com/voteforROOF/ and consider voting for me and encourage your friends to do so as well. I want to continue fighting for Delaware Teachers, Education Support Professionals, Students and Families! Thank you for bearing with me over the last few days. After our summit last week with the Treasurer, I had to spend a few well deserved days with the family, and on Monday morning, began to deal with House Bill 399 dealing with Component 5 issues. Now that the dust has settled, I want to let everyone who was not able to attend our meeting know how it went. First of all another THANK YOU to Treasurer Simpler and his team. They were able to address our group concerns and offer some valuable insight into the process and the reasons for the retirement plan changes. I also want to say THANK YOU to our DSEA hosts! Their hospitality and attention to detail helped make the Summit successful from a logistic perspective, and they also helped out with refreshments. A HUGE SHOUT OUT to Tammy Wagner of DSEA and Martha Sturtevant from the Treasurers office. Both of these wonderful ladies helped me set up the Summit, and were extremely patient and kind! The Summit began with a meet and greet. We had well over 30 people in attendance. As the group began to settle in Treasurer Simpler was introduced and was given an opportunity to share some of his background and the process under which the Deferred Compensation Committee worked. It is important to point out the Treasurer Simpler did outline who the specific members of the DCC were, and did explain that there was indeed a missing member of the committee , which traditionally had been a teacher. He spent a great deal of time going over the “Fiduciary” nature of his position on the DCC. There have always been sayings like “Pesto is the quiche of the 90’s” and “Orange is the new black”, so here is a new one for our lexicon….. “Fiduciary is the because I said so “of today! held or given in trust. (of a paper currency) depending for its value on securities (as opposed to gold) or the reputation of the issuer. The ‘fiduciary rule’ would force financial professionals to charge their customers more. Generally, the “Fiduciary Excuse” as I call it, (not to be negative, it just seems to cover so much i may use it to get out of a situation if I can from now on) was thrown around many times. All of our suggestions and solutions received the “Fiduciary Excuse” as the night went on. We talked about “Grandfathering” and “delayed start up” and other scenarios that would offer relief to our members, but ultimately, the “Fiduciary Excuse” always seemed to be the answer. There was also a great deal of legal back and forth between the Delaware Attorney Generals office and legislators. This seemed to also cause a slow down in the way information was getting out to our members. A representative from VOYA was present to address concerns and present VOYA to our members as the new Retirement Benefit vendor. I will say that their presentation and their plan for development was generally well received. VOYA seems to have some new and innovative products and platforms that may work out well for many of our members. It is unfortunate that their entry into our retirement benefit process was hampered by the process. I wish them luck in their future work with our Delaware State Employees. Ultimately the Summit was successful in getting the concerned parties to the table. At this point many of our DSEA Local Leaders have been informed about the changes, and have been able to share member questions and concerns. That was the goal of our Summit, and to that end, I believe we had some success. So where do we go from here? I spent the day in Dover on Tuesday and while dealing with Component 5 legislation, I was also able to sneak around both chambers of our Delaware State House. I was able to chat with a few legislators about our retirement issues. Each and every politician that i spoke with felt bad about what was happening with our retirement options. Each of them offered their support, BUT NONE OF THEM SEEMED WILLING TO GO THAT EXTRA STEP. At this point we may need legislation to slow down the process. When i directly asked each of these Representatives, and Senators about their willingness to craft a bill in our favor, i received less that enthusiastic responses. I have also reached out to Governor Jack Markell for aid both publicly and privately, but have received no response, so our chances of getting some kind of “Executive Reprieve” is not likely. SEND A MESSAGE TO YOUR LEGISLATOR! Lets continue to work together over the next few months so that more and more of our members and friends get the information. Please join other Union Local leadership and concerned friends as we meet with Delaware State Treasurer Ken Simpler and members of the Deferred Compensation Council to discuss recent changes to Delaware School Employee Retirement Plans. 6:45 to 7- Next steps. After saying farewell to our guests, we will use this opportunity for our coalition to go over the evenings information and plan our next steps. Please RSVP to me by email or Text/Call. We will have refreshments for our meet and greet and want to try and get a solid count. Thank you again for all you have been doing…WE HAVE MADE A DIFFERENCE ALREADY! !